Canine loss of vision and blindness in one or both eyes can be caused by a number of factors, from normal aging, injury, heredity, or eye disorders or diseases. But how do you know if your dog's vision problems are due to aging or something else? Most dogs experience vision loss gradually over time. The chart below shows how canine vision naturally changes as dogs age. 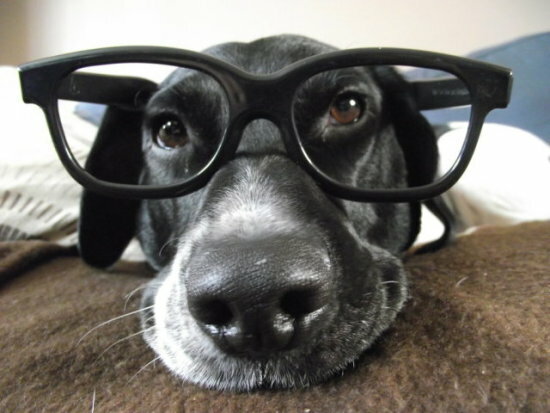 Contrary to humans, who become more farsighted as they age, dogs become more nearsighted with age. 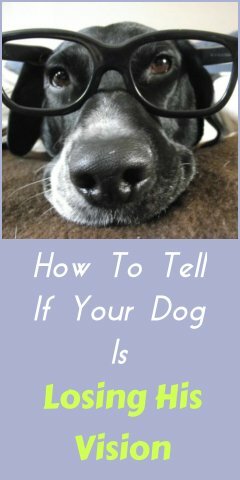 You may have noticed this in your own dogs. But for some, the loss of vision can be rapid and sudden. Watch your dog closely to see if he displays any of these signs of vision loss. And if he does, seek immediate veterinary care. Dogs have a tendency to memorize their surroundings as their vision declines, so you may not be able to tell immediately if your dog can't see his surroundings. However, if she shows signs of confusion or seems clumsy in new areas, it's possible she's experiencing vision loss. To test this, you can take your dog to a new area or home to see how well she moves around in it. If your dog seems to step high or with great caution or have her nose very close to the ground or bump into things, it is a good sign that your dog may have problems with his vision. Night vision is usually the first to go. However, loss of night vision often goes unnoticed because it's difficult to gauge vision problems in the dark, and because dogs have a tendency to memorize their surroundings. To test your pup's night vision, try moving some furniture just a bit to the left or right, forward or backward, of their current position, turning off the lights, and calling the dog towards you. Your objective is not to hurt your dog, so be careful how you do this exercise. If he bumps into things on his way towards you, you might want to have his vision checked. If you turn on the lights and your dog still has problems navigating around the new placement of objects, that is also a clear indicator that your dog has vision loss. If your dog's eyes look cloudy, fuzzy, white, blue, or even teary, it may be a sign of vision problems or eye disorders. Cloudy eyes are common in many older dogs, but they can also be a sign that your pup has a corneal ulcer, nuclear sclerosis, an abrasion or, the most common sight impairment in older dogs, cataracts. Also, cloudy eyes may be a sign that the cornea is inflamed, resulting in vision problems. Your pup's eyes may also be teary, and you may notice some squinting or pawing at the eye. Large or dilated pupils could be a symptom of glaucoma, or other vision problems such as progressive retinal atrophy which can lead to permanent blindness. Enlarged pupils may also be a sign of toxicity, medication side effects, or stress. If your pup develops enlarged pupils, it's a good idea to take him to the vet. If your dog doesn't react to his favorite treat or toy from a distance, seems to smell things before he sees things, or gets easily startled, it's possible he's experiencing vision problems. To test this, try dropping a toy in front of him without hitting his nose. If he doesn't react to the toy until it hits the ground, or doesn't follow it as it's moving, there's a good chance he's experiencing vision problems. If your dog shows any of these signs, be sure to take him to the vet as soon as possible to get him checked out. 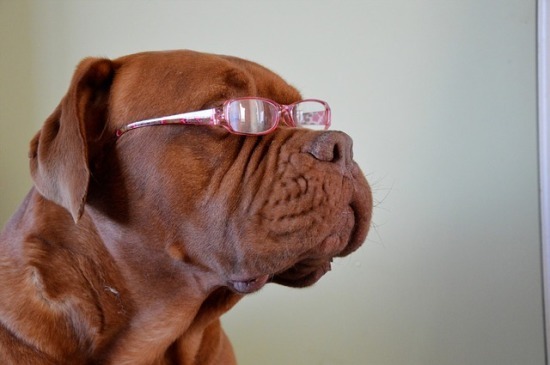 While canine vision loss and blindness are always difficult, don't panic. Since dogs have and rely on their keen sense of smell and sound, your dog will still be able to navigate around, especially in the home and other places she knows, even with significant vision loss. Just get her to the vet to check out the cause of the problem, get necessary medication, and find out how you can help your dog avoid or minimize any further vision loss. It may be helpful to boost your dog's nutrition For natural supplements that help with vision, you can see our recommendations for Dog Vision Supplements here. I have personally tried using Ocu-Glo for my oldest dog and I felt like I saw a noticeable improvement in his vision and his overall engagement with the world after a few months. I had him checked by the vet first and he did not have any serious medical condition, just some vision loss associated with aging. So I do believe supplements or just a more nutrition-rich diet can be helpful. If you're not sure about your dog food, take a look at our post on Top 5 Best Dog Foods. You can also boost his regular food with some anti-oxidant rich fruits and veggies and fish oil as a snack. Originally published October 2012 and last updated February, 2017.